The project is designed to address the unemployment challenges faced by people in the Kuryk village of Mangistau Oblast. The project aims at developing needed skills and creating enabling environment for local residents to encourage them to start small businesses. 2) Handicrafts development component for local women. 20 new businesses will provide Kuryk community with goods and services. 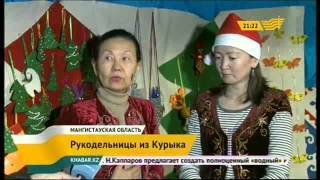 15 women of Kuryk will receive regular income from handicrafts. As a result of project activities, five new Kuryk business start-ups were created - a taxi service, quail farm, beauty salon, shoe repair shop, and a felt workshop. EFCA further continues the project by providing follow-up business consulting support to existing businesses, building increased technical capacity of local artisans, and improving the quality and market attractiveness of traditional crafts products. Social Entrepreneurship Development Program "ZHARKYRA"
Promotion of the innovative social initiatives aimed at ensuring the sustainable entrepreneurial solutions to social, economic, and environmental problems of communities in Atyrau and Zhylyoi area. The project is designed to address the unemployment challenges faced by people in the Kuryk village of Mangistau Oblast.